Sometimes I think that the best presents can be the ones you can share with your family, I know in the past when I have had presents.. the most memorable ones were the ones that were experiences or days out. Today I thought I'd do another Gift Guide: Family Edition. Hope this gives somebody a few ideas. This is a fun one, Merlin owns loads of attractions in the country for example..Alton Towers, Thorpe Park, London Dungeon, Blackpool Pleaure Beach are to name a few. So a pass for the family would be a really decent thing, plenty of days out to enjoy. The most expensive VIP Pass is £599 for a family.. I know what you're thinking thats bloody expensive! But if you think 1 adult to get in to Alton towers is roughly nearly £50 think how much a day there would cost and then work that one out planning on how many times a year you'd visit these places.. So I definitely think it's an investment. I love theme parks so this would definitely be something worth considering. 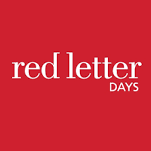 I've heard loads of good things about Red Letter days. Basically they're a experience company so if you wanted to get anything from a hot air balloon ride all the way to an afternoon tea. This would be your place. They have so many cool gifts and pretty reasonable prices too. A few I like are the supercar driving (aston martin), spa breaks, flying lessons (definitely something I'd like to try!!) This would a great gift especially if you can get everyone involved with the gift. This is a gift I know I'd love to receive, if you know someone who would love to see something in particular then what a great evening/day out! Or you can buy vouchers and they can choose themselves, especially when you can choose from musicals, concerts, festivals ect. Music brings everyone closer and all that. hehe. I'm new to this one after only recently being introduced to it. This sounds like the perfect day out, so if you want to go on a walk somewhere, Treasure Trails have self-guided hunts all over the country, there are simply a few questions and you've got to solve the clues. It sounds like the perfect day out as I love family walks.. but sometimes I've always felt like they need jazzing up a little bit and finally someone has done it. Can't wait to try this out. Have you any other ideas of Family gifts or have you recently purchased one?